Little is known about the life of Saint Joseph, and what is known is taken directly from the Scriptures. Joseph was a descendent of David, the king of Israel, and therefore of royal lineage. However, this bloodline did not result in wealth of privilege. Rather, we know that Joseph was a poor, working man, trained in the trade of carpentry. While devout in following Jewish law, he could only afford turtle doves, rather than the recommended lamb, as sacrifice at the circumcision of Jesus. By all counts, Joseph was a humble and gentle man, perhaps a bit older than Mary upon their betrothal, but this fact is unclear. We are told in the Scriptures that upon discovering that Mary was pregnant, but not realizing that she has been selected as the vessel of the Incarnation of the Lord, Joseph plans to take care to divorce her quietly. Despite what must have been humiliating and upsetting news, he understands that public divorce would lead to judgment, shame, cruelty, and even possible stoning of Mary for adultery, and this is something he cannot bear the thought of. 20 But after he had considered this, an angel of the Lord appeared to him in a dream and said, "Joseph son of David, do not be afraid to take Mary home as your wife, because what is conceived in her is from the Holy Spirit. 21She will give birth to a son, and you are to give him the name Jesus, because he will save his people from their sins." Of course, as we know from the Gospel of Matthew that Joseph was not only caring and compassionate in his consideration of Mary, he was also a righteous and devout man, obedient to the Lord. Upon receiving his announcement from the angel of the Lord, Joseph followed his instructions perfectly, naming his new son Jesus on the eighth day after his birth. When the angel returned and told Joseph to flee to Egypt, he did so, struggling to make ends meet for his family in a strange and foreign land. And when the angel told him to return, he again packed up his family and life, moving to Nazareth in Galilee. There, he works in a carpentry shop, and we are told that Jesus oftentimes accompanies or assists him there. After that, the history of Joseph primarily comes to an end. Only when Jesus is twelve, and is missing for three days in the temple, do we again hear that Joseph and Mary searched for Jesus with great anxiety, testament to the fact that Joseph loved his son, and served as a good father. Biblical historians and scholars agree that Joseph likely died sometime between Jesus’ twelfth and thirtieth birthday, as Mary is described as widowed by the time Jesus begins His public ministry. 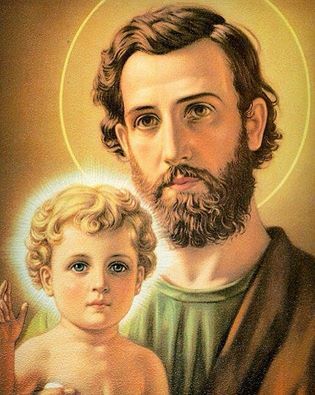 Little is known about Saint Joseph’s death, although we can imagine that it was a death surrounded by the love of Mary and Jesus, and therefore holy, the way in which we might all chose to leave this earth. Saint Brigid of Sweden said of Saint Joseph: "St. Joseph was so reserved and careful in his speech that not one word ever issued from his mouth that was not good and holy, nor did he ever indulge in unnecessary or less than charitable conversation. He was most patient and diligent in bearing fatigue; he practiced extreme poverty; he was most meek in bearing injuries; he was strong and constant against my enemies; he was the faithful witness of the wonders of Heaven, being dead to the flesh and the world, living only for God and for Heavenly goods, which were the only things he desired. He was perfectly conformed to the Divine Will and so resigned to the dispositions of Heaven that he ever repeated" May the Will of God ever be done in me!" He rarely spoke with men, but continually with God, whose Will he desired to perform. Wherefore, he now enjoys great glory in Heaven." Saint Joseph utters no recorded words in the Bible. We see a gentle man, compassionate with his wife, loving and concerned for his son, and obedient to the will of the Lord. He demonstrates bravery and courage, dedication to his role as father, and humility. Apart form Mary, Joseph is the individual who spent the most time with our living Lord. We can picture instructive moments in the carpentry shop, and the fatherly pride that Joseph must have felt for Jesus, his son. Saint Joseph’s willingness to answer the call of the Lord with gentle and compassionate courage prepared the way for the birth of Jesus, for His coming into our lives. How can we use the life of Saint Joseph as a model for our own, answering the call of the Lord, and bringing his Son, Jesus Christ, into the lives of others?